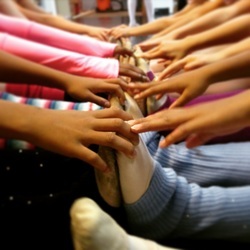 ​At Rejoice School of Ballet we believe all children should have access to classical ballet training and the life-long skills this training offers. Our sliding-scale tuition provides around 10 percent of the total cost of training our dancers. We simply couldn't do the work we do without the partnership and support of churches, businesses and community members. So, whether you love the arts or want to invest in the spiritual and mental health of young people in our community, there is a place for your partnership at Rejoice. Level 1: Up to $1,500 a year. Your donation helps pay for dance wear and instruction. At Rejoice, we hire from among the best dance instructors in the city. Each dancer is also provided with the dance wear and shoes they need. Level 2: $1,500-$3,000 a year. The whole dancer is our focus at Rejoice. In addition to ballet training, we focus on four pillars: Spiritual Formation, Diversity, Health and Nutrition and Life Skills. Investing in our programming means investing in the spiritual, physical and mental health of our dancers as we invite experts in counseling, nutrition, physical therapy and spiritual formation to provide service and support to our dancers and families. Level 3: $3,000-$5,000: ​Every year we offer Summer Intensive training to our dancers. Our faculty includes Nashville Ballet company members and other local professional dancers. Your donation helps support dancers who otherwise could not afford this crucial piece of their dance training. Level 4: $5,000-$10,000: Our pre-professional track offers up to 15 hours a week of training for our oldest and most skilled dancers. This amount of training is necessary for dancers who plan to pursue dance as a career or in college. Investing in dancers at this level helps ensure they are prepared to continue their dancing as professionals or as part of their higher education experience. In February, more than 25 pre-professional track Rejoice dancers will perform the classical, comedic ballet "Coppelia" for an audience of nearly 1,000 community members. By becoming a sponsor of the show, you support an important performance opportunity for dancers that requires no fees for costumes and affordable ticket prices to excellent art for the wider community. Includes: logo presence and recognition on all publicity and marketing materials; production program distributed to more than 900 attendees; poster at the event; inclusion in media releases; 8 tickets to a show; Invitation to dress rehearsal; engagement with dancers at post-show reception; opportunity to engage employees in Rejoice volunteer opportunities and a table at the annual luncheon. Includes: logo presence on all publicity materials; production program distributed to more than 900 attendees; 6 tickets to a show; opportunity to engage employees in Rejoice volunteer opportunities. Includes: logo presence on all publicity materials; production program distributed to more than 900 attendees; 4 tickets to a show; opportunity to engage employees in Rejoice volunteer opportunities. Includes: logo presence on all publicity materials; production program distributed to more than 900 attendees; opportunity to engage employees in Rejoice volunteer opportunities. Corporate Matching Gifts: ​Does your corporation or business have matching funds for the charities you support? This is a great way to increase the amount of your gift. Other Sponsorships: Every year Rejoice has sponsorship opportunities for our annual Poised and Positioned Luncheon and our Annual Spring Showcase at Belmont University. ​Link your Amazon account to Rejoice and Amazon will give a percentage of your spending to Rejoice. It's that easy! By linking your Kroger Plus card to Rejoice, your shopping helps dancers receive excellent training. Kroger Community Awards give a percentage of your spending to Rejoice. Purchasing an Arts license plate helps provide grant money to several arts organizations in Tennessee, including Rejoice.